The Cesarean section rate in the U.S. has been skyrocketing for years. According to the National Center for Health Statistics, C-sections rose to 30 percent in 2005 from 5.5 percent in 1970. Some experts point to women who choose to have elective C-sections. But then there are those pregnant moms who are forced to have them, Time magazine reports. The number of vaginal births after Cesarean, also known as a VBAC, is dwindling (down to 8 percent of all U.S. births) and helping to boost the rising surgical delivery rate. For many pregnant women in the United States, it's easier today to walk into a hospital to request a C-section than it is to give birth nautrally, the magazine reports. According to Time, more than 9 out of 10 births following a C-section are now surgical deliveries, citing the conventional thinking that "once a Cesarean, always a Cesarean." Second-time moms in the Time article recount how they were unable to find a doctor willing to let them push this time around and labor after having a C-section with their first babies. Some health experts cite the risk of uterine rupture during a VBAC, which can be fatal for both mom and baby. But statistics show that ruptures happens in 0.7 percent of cases. 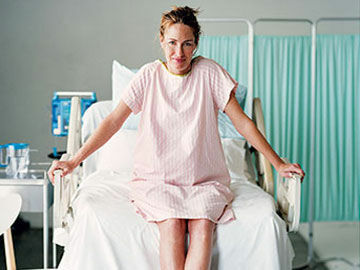 Other experts point to the rising price of malpractice insurance for OB-GYNs who perform VBACs. The Time article cited a recent study that found many hospitals don't have official bans on VBACs, but no obstetricians will perform them. If you have had a C-section, you may or may not be eligible for a vaginal birth the next time you deliver. Make sure you discuss your birth options with your OB-GYN.